The Royal High School hosted a Public Speaking competition for Bath Schools’ students who speak English as their additional language. The competition is only open to students who have been studying in an English-speaking environment for less than two years with entrants from Kingswood, Prior, Monkton, Stonar and the Royal High. 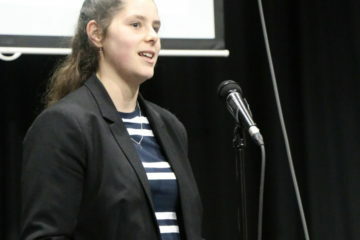 Royal High student Triana Rubio Bellon in Year 9 spoke about Endangered Animals, suggesting actions to the audience that we might take. Arya Ma in Year 12 explored a current issue of mislabelling and economic deception, drawing upon an example from her own country China involving the sale of trout as salmon. Year 8 Jean Yang at the Royal High was awarded first place in the Junior Section with a poignant and humorous take on why we sometimes need to say ‘No’. Jean concluded that because the English use the word ‘sorry’ so much, so long as you say sorry a few times before explaining that you cannot complete a task, it is hugely beneficial!